Practical ingenuity underlies the stylish and contemporary design. Not only does the Porron carafe designed by Zweitse Landsheer have a fine grip, but the uniquely shaped handle also ensures that the contents of the carafe pour smoothly. These designer carafes are made of matt white ceramic. Its contents remain cool! Excellent addition to your tableware and trendy table decoration. 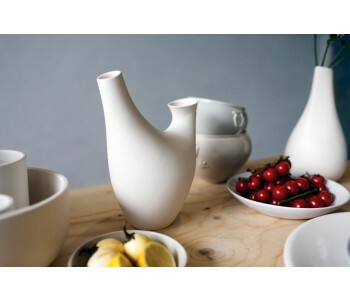 The matt white carafe Porron produced by Cor Unum Ceramics is not only stylish but also very practical. The flowing spout and the unusually shaped handle give the Porron water carafe by designer Zweitse Landsheer a sculptural value. This timeless designer carafe is not only a great addition to your kitchenware but also a beautiful table decoration! The Cor Unum Porron carafe is designed by Zweitse Landsheer. This Amsterdam designer lived from 1928 to 2010 and was the artistic director of Cor Unum. 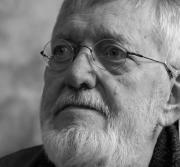 As a designer, he is best known for objects such as the Diabolo cups, Porron, and Bouquet Vase. 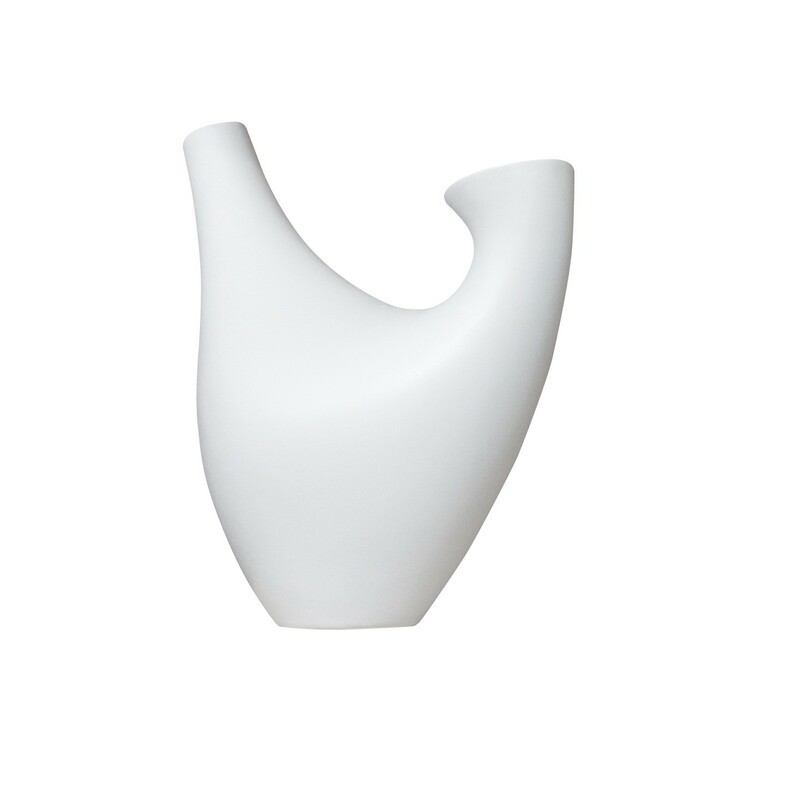 The Porron water or wine carafe is inspired by the Spanish drink pouch. Practical ingenuity underlies the stylish and contemporary design. Not only does the Porron carafe by Cor Unum have a fine grip, the uniquely shaped handle also ensures that the contents of the carafe pour smoothly. Furthermore, the contents remain cool thanks to the ceramic. A very smart design by those Spaniards! The work of Zweitse Landsheer marks the establishment of studio Cor Unum in ’s-Hertogenbosch in 1953. The name Cor Unum stands for ‘one of heart’. To underline this, the people at Cor Unum Ceramics work with a certain distance from the labour market. 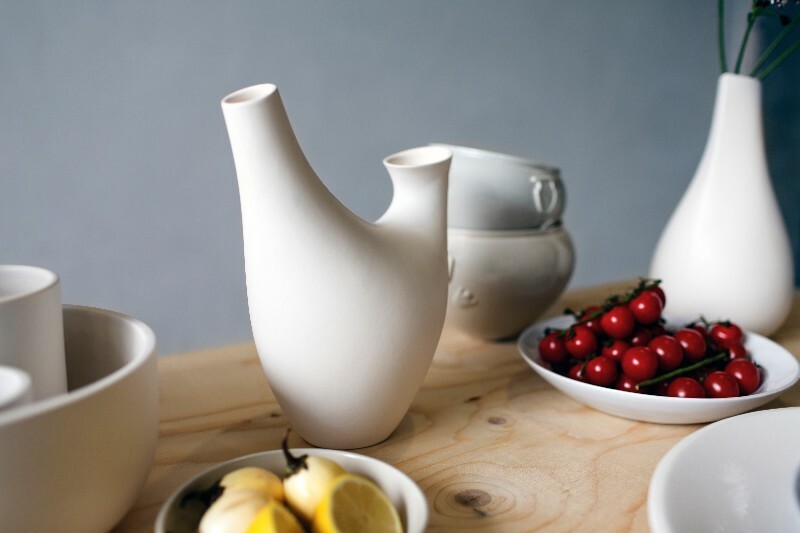 This matt white ceramic Porron carafe is made in small amounts. This water carafe is 26 cm high, 24 cm wide, and 13 cm deep. Comfortable to hold, easy pouring, cool drinks, and contemporary design; what more do you want?